and private parties, through December of 2019. Dates and times are filling up quickly. contact June to design a custom program for you. their were friends, family, movement and music!" 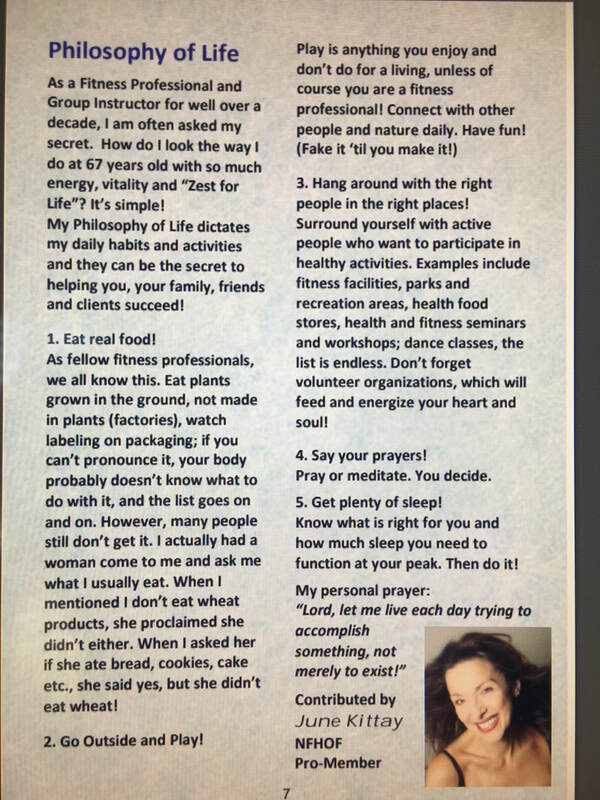 ​WIT, WISDOM AND WONDERFUL WAYS TO A HAPPY HEALTHY LIFE! Join June as she shares her insights on Healthy Aging. Renew your “Zest for Life!” Start today! Discover how to develop healthier habits, ones that are better for your physical, emotional and spiritual health. Join June Kittay for a fun and inspiring seminar. Explore the fundamentals of a healthy, active life, understand why you are stuck, and develop a roadmap on how to survive and thrive in this crazy mixed up world. Get up, get started, get moving and have fun doing it! This is Tampa Bay's Largest Office Party! The IOA Corporate 5K is a celebration of workplace wellness, bringing together organizations and individuals from throughout the community for a fun evening of fitness, networking, community pride, music, team camaraderie, entertainment and a whole lot more! Put your best foot forward in creating a happier and healthier workplace by registering your team today! Get ready for Tampa Bay’s most exciting nighttime 5K! Run or walk your way to the finish with co-workers, family and friends. Our scenic 3.1-mile course boasts all of what there is to love about downtown Tampa. Enjoy great music, entertainment and even stop for a photo or two along the way! Don’t forget to check out all the team and individual awards that you and your organization can compete for! 6:20 Come and Warm Up with June and Samuel! Welcome Team Leads June Kittay and Alice Slayton. This is fun for all ages. "Seniors Shifting to Wellness Oriented Interests and Activities"
Join us for juvenation at the South Tampa Y on Himes Ave.every Monday evening at 7 pm. ​No problem...just tell the front desk she invited you! June also teaches at the USF Botanical Gardens (main campus, Fowler)- every Friday. ​ Free, donations accepted, but not required. ​Connect with nature! Destress-Relax-Do something good for you mind, body and soul! Get started today! Make this year your best year ever! Come and join us for beginning Line Dance at the Harbor Sounds Fall Fest! Time to be anounced soon! When: Tuesday, February 13th, 5:30pm to 7pm. Where: AARP St. Petersburg Office. 360 Central Ave. St. Petersburg , FL 33701. Combine the advantages of physical and mental fitness exercises to produce exceptional fun and enhanced health. Both instructors have worked with older adults for many years. They are experts on how to age successfully. They will demonstrate the exercises and you will enjoy practicing them! To find out more, please contact June for next workshop in your area! Want to learn to teach a successful program? Few exercises beat dancing for overall benefit to mind, body and spirit. Being physically active also helps reduce the chance of experiencing a fall. Dancing builds strength, balance, and flexibility, while the cardio benefits your heart and brain. 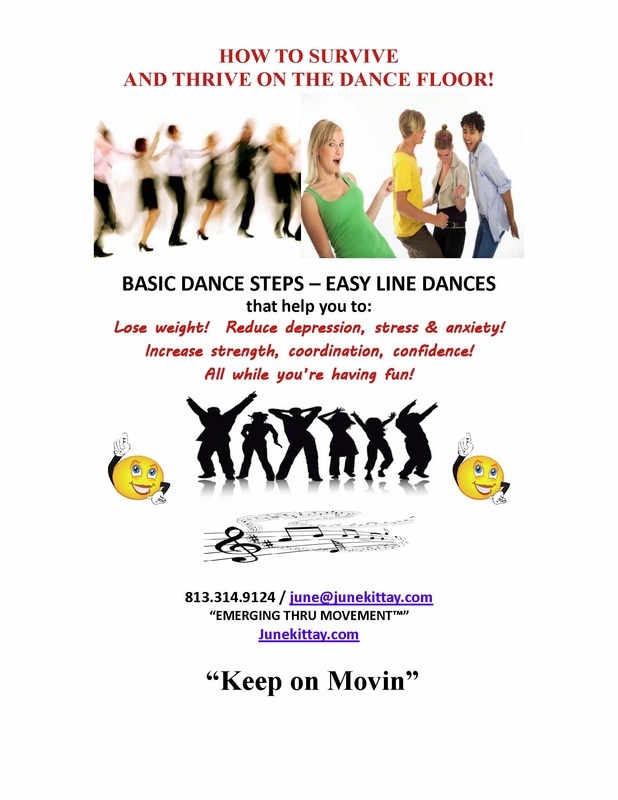 Line dancing is fun; no partner is required! Meet new friends, and move to the music you love. It will be the most fun you have all day! June conducts these classes at retirement and senior centers around town. Email June if you want her to run a class at your facility/community. Discover how to develop healthier habits, ones that are better for your physical, emotional and spiritual health. Join June Kittay for a fun and inspiring workshop. Get up, get started, get moving and have fun doing it. Dancing builds strength, balance, and flexibility, while the cardio benefits your heart and brain. 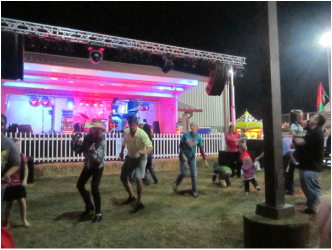 Line dancing is fun; no partner is required! Meet new friends, and move to the music you love. It will be the most fun you have all day!Check back regularly for new classes. June also conducts these classes at retirement and senior centers around town. ​Bring June to your group for a fun functional fitness program. Why you should exercise/How to get started…So many choices! Email June if you want her to run a program at your facility/community. This joke rings sad but true for many of us. Let your healthy shape emerge and improve your physical and emotional health with the facts and movements you'll learn in this course. Discover the fundamentals of exercise through lecture and interaction and have a great time doing it! Make Friends. Have Fun. Get Fit! Finally. Reserve your place now! Limited enrollment. If you ever wanted to make friends, have fun and get fit...and make money doing it, this workshop is for you! Great for schools, corporations, lifestyle communities, churches, and community organizations. Call now to find out more! June Kittay is not one to stand still for long. At 66 years old, the Tampa Bay fitness and wellness instructor believes movement is the key to life—and she is her own best example. “The body is a system of wheels within wheels meant to rotate and revolve on a weekly basis,” she explains. “You’ve got to keep moving. You’ve got to stay active.” June says she has always maintained a high energy level, but came to realize the true value of movement and exercise after a car accident 13 years ago. Her injuries led to back surgery, which forced her to spend several weeks at home recuperating. She became frustrated at being cooped up inside and forced to take it easy. Her daughter, a fitness instructor at the YMCA, suggested she come in and attend her Silver Sneakers exercise class for older adults. June became certified as a fitness instructor, determined to focus on seniors. She says the socialization aspect of exercise classes for people who often spend far too much time alone is almost as important as the exercise itself. June sought new ways to get seniors moving. She added yoga and line dancing to her class offerings. She found music to be a great motivator for getting people who might be reluctant to exercise to get up and move. As she advocated for using exercise to battle the aging process, June made a name for herself. 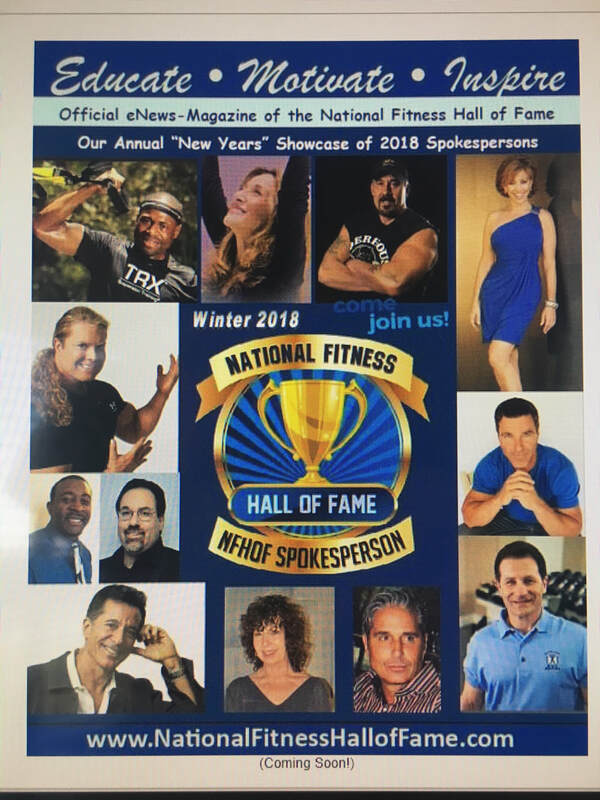 A member of the National Fitness Hall of Fame, June has worked and appeared with tennis great Martina Navratilova, exercise gurus Jack LaLanne and Richard Simmons, and golfer Chi-Chi Rodriguez. June teaches a range of health and wellness classes at the Osher Lifelong Learning Institute at the University of South Florida, has written a book, Tips by Kittay, and is featured in a DVD. 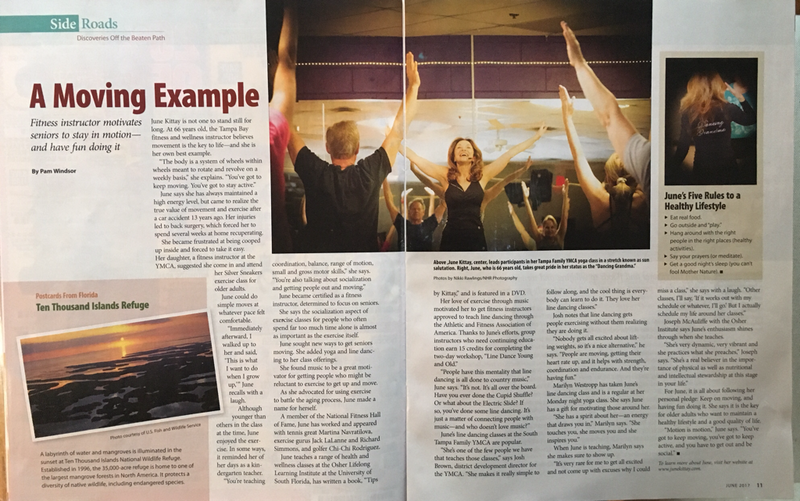 Her love of exercise through music motivated her to get fitness instructors approved to teach line dancing through the Athletic and Fitness Association of America. 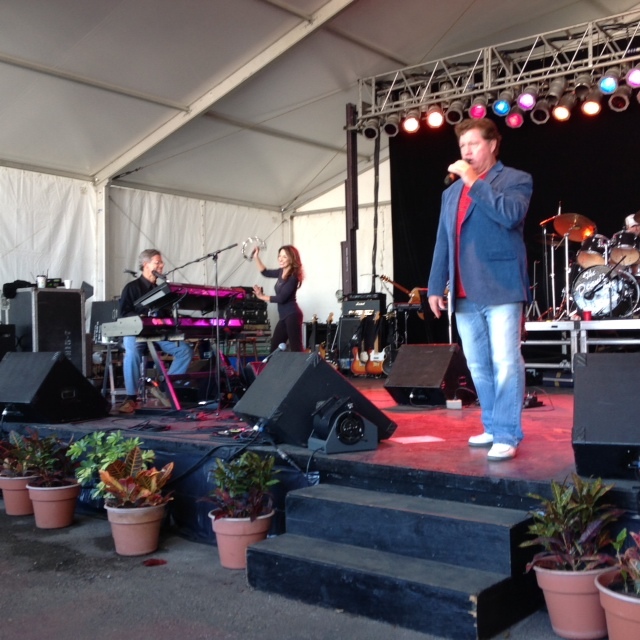 Dennis Lee Band - Rocking Away at the Rockingham County Fair! to sooth and leave you feeling healthier and more centered. Only you can take of you! ​95% of success in walking through the door! Not a member? No problem. Just tell staff at the door June invited you as her guest. ​ it's just doing it that's hard! 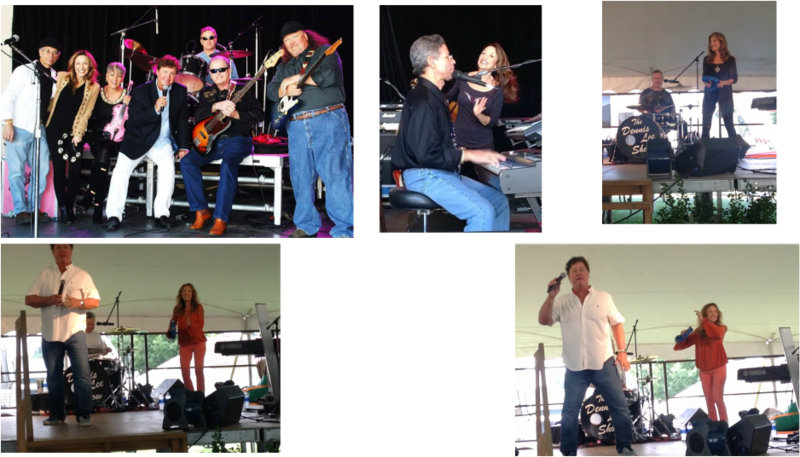 June was seen out and about, performing with Fair celebs! June presented several seminars and interactive fitness sessions for Teachers and Education Professionals at the Tampa Convention Center for the NAIS, National Association of Independent Schools and People of Color. 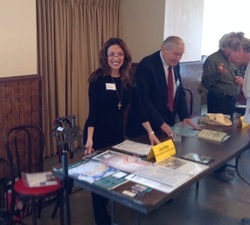 June did a meet & greet at the Centro Asturiano open House. Attendees also got to meet the outstanding OLLI faculty and hear about the awesome classes that are offered. Throughout the year, June was thrilled to have the opportunity to teach at the South Tampa Y.
June joined nationally known pianist Leon Jacobs Jr at Callaway Gardens Pine Mountain Georgia for the Summer Family Adventure summer camp for the whole family. South Tampa Y Students joined June for the fun at the 2014 Florida State Fair. 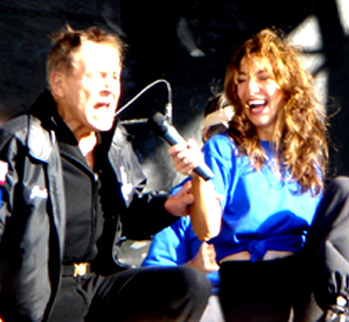 No, I am not Jane Seymour, as Dennis often introduces me. But you will never believe how many people come to me after the show and tell me how much they enjoyed me on Dr. Quinn, Medicine Woman! What is your body telling you when it reacts to the foods you eat? Learn how your food choices can directly affect your well-being. Attendees brought their concerns to this course on food sensitivities and the importance that movement can play in assisting digestion and ridding your body of toxins. They heard practical tips, learned the holistic point of view, and had an opportunity to participate in basic movement activities. June co-taught this course with Dr. Steven Friedman, DC, DOM. Dr. Friedman is classically trained and experienced in chiropractic care and all aspects of oriental medicine and has advanced training in sports injury, neurology and orthopedics. ...on What is Inspiration & What do you want your Legacy to be? June on the national radio show Boomer Nation! 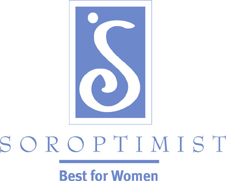 Information & Inspiration to live, work & play at our Boomer best! Listen to some of June's terrific advice! Tips for Making Fitness Fun! June gets listeners up & moving! June was honored to teach Line Dancing for a meeting of the beautiful ladies from the Sister's Network at the Central City Y. Talk about a fun group! And prayers to the survivors! June is so blessed to do what she loves! June was the guest speaker at OLLI USF "Creating Your Backup Plan". She discussed volunteer opportunities for Boomers and Seniors in the Tampa Bay Area. Are there times when you just can't figure out why you feel crummy, and neither can the doctor? You may have food sensitivities, also known as food intolerances. These are different from real allergies, but can cause symptoms and conditions that are just as uncomfortable or severe as a serious illness. Being aware and knowing what foods to avoid can change your life. Leon Jacobs Jr. on the Keyboard and June played tambourine! Here it is! I ran the 5K. Not great, but was the last to leave in the Stroller Division. Had my Grandson with me and could not get through the crowd. Hang around with the right people in the right places if you want to get or stay healthy, fit and feeling fantastic! 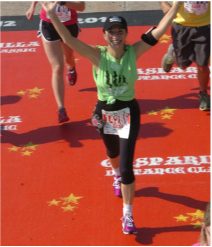 June walked in the 2014 Gasparilla 5K. First timers were encouraged to come out, and those who just want to "Hang with the right people in the right places," have fun and meet some new friends. The only running happened at as they crossed the finish line, cameras taking photos! June was the presenter for the "body" segment in the Centre Club's 3 part series for women ages 50 and older to explore topics which impact our self-concepts, "Mind, Body, Spirit." In a society that values youth and productivity, how can we continue to add to, not subtract from, our lives as we age? Sometimes called The Third Act - a time of transition into older adulthood - women often struggle with where they are on their life journey. Are there times when you just can't figure out why you feel crummy, and neither can the doctor? Are you often tired, confused, achey, and depressed? You may have food sensitivities, also known as food intolerances! These are different from real allergies, but can cause symptoms and conditions that are just as uncomfortable or severe as a serious illness. Being aware and knowing what foods to avoid can change your life. June was a presenter at OLLI's Open House event and her Waterside Tour or 4 week seminar, "Sick or Sensitive?" alongside Tampa's Police Chief Jane Castor. Castor built a reputation for working side-by-side with citizens, neighborhood leaders, activists and business owners to solve crime problems and improve our community. Those strong partnerships are now the foundation of the Department's crime reduction strategy, leading to unprecedented success in making Tampa a safer city. Since it's induction in 2003, Chief Castor's "Focus on Four" crime reduction plan was the driving force behind Tampa's 64 percent reduction in crime. at the Halloween Bash aboard the Carnival Paradise leaving from Tampa, Florida. 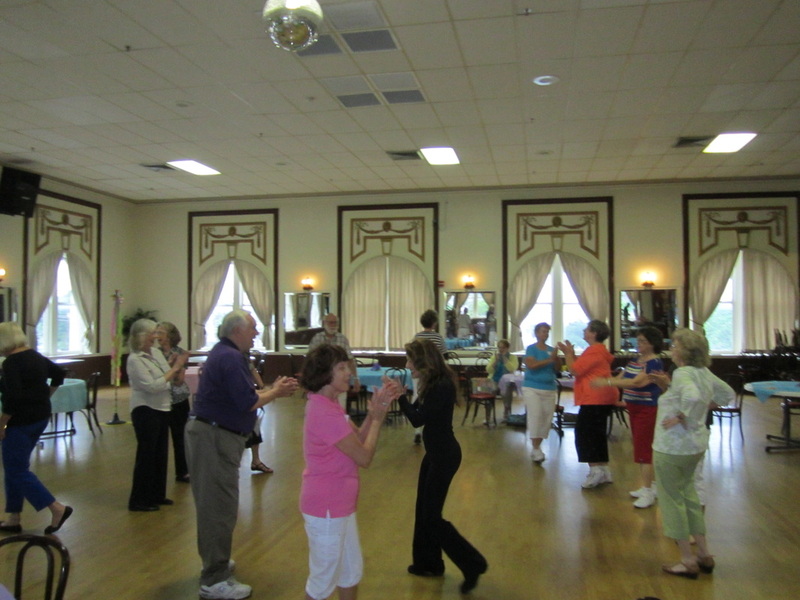 June taught "Emerging thru Movement" combined with Line Dancing for Fun & Fitness on board. She is an expert tour guide in the Tampa area. June's seminar on how to manage stress and incorporate exercise into a busy schedule was extremely well received by all. Also starring World Champion Swing Dancers; Instructors Robert Royston & Nicola from NY Broadway Show "Swing" and "Urban Cowboy". and everyone was Groovin' together! De-stress! Increase your energy! Renew your “zest for life”! at the Florida Blue Center. June was asked to provide inspiration to all Tampa Bay's devoted volunteers at several Volunteer Recognition Events in the Tampa Bay Area. Over 1800 women attended her seminars! She was joined by Big Pappa! 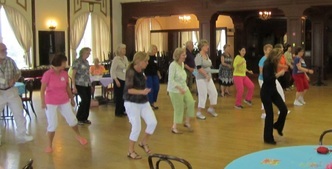 June taught Line Dancing at the Osher Lifelong Learning Institute "Spring Fling"
June Also Works with the Very Young! June taught Line Dancing to the Brownie's since it's great for socialization, exercise, balance, coordination, and just plain fun! These girls were 6-7 years old, and they rocked to the Cupid Shuffle. The Birth and Death and Future of the Florida Dream. Leon is known to the nation as "King of the Ivory Keys"
Tribute and Celebration in honor of NC Dept. of Agriculture. "Baby Boomer Mental Health 101"
THIS WAS A FREE EDUCATIONAL EVENT OPEN TO ALL. "How to Survive & Thrive on the Dance Floor"
June was a Presenter at "Baby Boomer Mental Health 101"
June offers her book and DVD for sale at most of her engagement. June warming up the runners before the race. June's well known class "How to Survive & Thrive on the Dance Floor" was well received as a great way to Control diabetes by de-stressing & loosing weight while having a blast! "She is one passionate and intelligent woman,"
was about to premier on Lifetime. She rocks the Healthy Aging World. 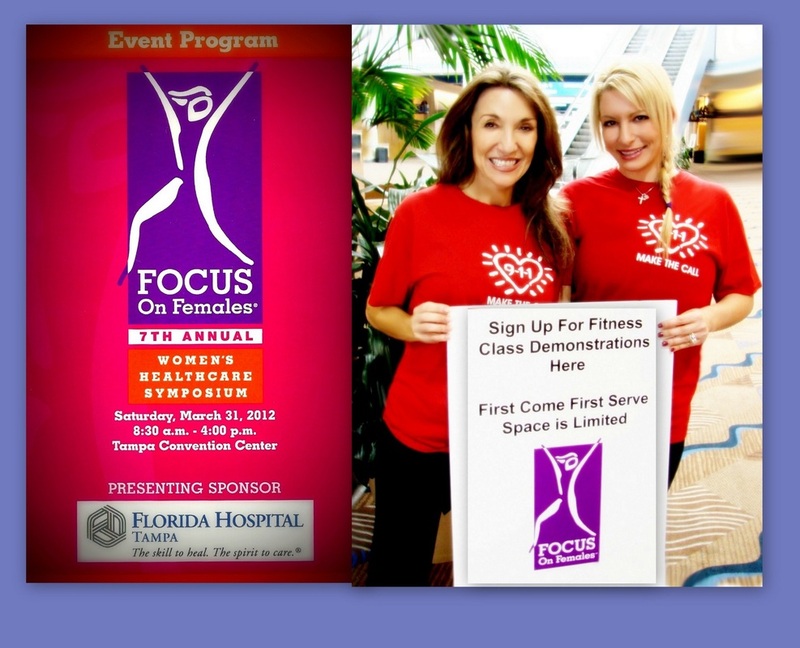 Hosted by Tampa Bay & Company, of which June is a proud member! "Hang with the right people in the right places"
We are both trying to make a difference". "How to Survive and Thrive on the Dance Floor"
"Would take her classes myself, but can't keep up! June and the Girls really did strut their stuff! 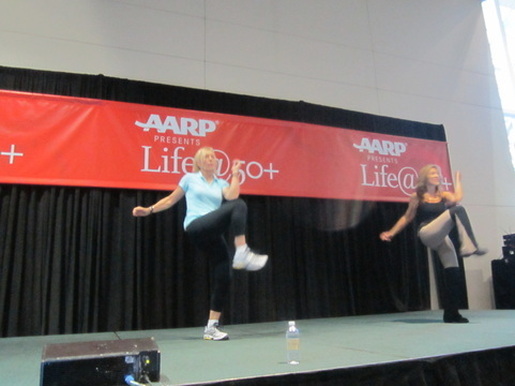 June provided Stretch, Balance and Line Dancing Interactive Demonstrations. "Wit , Wisdom and Wonderful Ways to a Healthy Happy Life"
who have so graciously volunteered their time to working with children in the school system. "Wit, Wisdom, and Wonderful Ways to a Happy Healthy Life"